Will China Launch an Anti-Satellite Test Soon? China may be gearing up to perform a controversial anti-satellite test this month, perhaps in the next week or two, some experts say. For several months, rumors have been circulating within the United States defense and intelligence communities that a Chinese anti-satellite test is imminent, says Gregory Kulacki of the Union of Concerned Scientists. It could even be conducted on Jan. 11, the date on which China performed ASAT operations in both 2007 and 2010. "Given these high-level administration concerns, and past Chinese practice, there seems to be a strong possibility China will conduct an ASAT test within the next few weeks," Kulacki wrote in a blog post today (Jan. 4). "What kind of test and what the target might be is unclear." 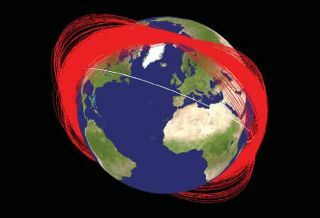 In the 2007 test, China destroyed one of its own defunct weather satellites at an altitude of 530 miles (850 kilometers), spawning about 3,000 new pieces of space junk. The 2010 operation used similar technology to take out an object that was not in orbit. "There are different types of technologies that can be used as ASAT weapons, and a satellite may not be destroyed at all," he wrote today. "The planned test could be of the same technology as the 2007 and 2010 tests but in a missile defense or flyby mode, or a test of technology that doesn’t destroy a satellite." Some U.S. officials suspect China may want to go higher than it did in either 2007 or 2010, targeting an object 12,000 miles (20,000 km) or so above Earth's surface. This ability to reach medium-Earth orbit (MEO) could theoretically put the constellation of U.S. Global Positioning System navigational satellites at risk. "But there are good reasons for China not to destroy a satellite at this orbit, including that China plans to use this part of space," Kulacki wrote. "Creating debris, as it now understands, would threaten its own satellites. Over the next several years, China plans to place more than 20 new navigational satellites in MEO." Kulacki urges the Obama Administration to attempt to dissuade China from conducting any more destructive ASAT tests. Both the United States and the Soviet Union abandoned such tests as their space programs matured, he notes. "Hopefully, China will eventually come to a similar conclusion," Kulacki wrote. "Beginning a meaningful bilateral dialogue on space security between the United States and China could hasten the day."